Are you considering a change in your career? Are you experiencing sadness, confusion, and overwhelming stress about your life choices? Are you looking to give your life a makeover? If you’ve answered YES to any of these questions, then let’s work together to come up with some solutions! As your Life Coach, I will work with you to problem-solve any issues you are having in your career, your romantic life, and your personal daily life. We will meet for an initial consultation session where we will outline all of your concerns and tasks that you want to work on and we will prioritize their importance while deciding how many sessions we will need to work on these issues. Each session will be very specific to our initial outlined plan, as I am able to help you with concrete tasks such as organization, planning, and time management as well as emotional development and insight towards your patterns that have been holding you back from your personal goals. We will work as a team to uncover your strengths and weaknesses and tailor our approach to best suit your schedule and lifestyle. Skype and Facetime sessions are also available for those with busy schedules. As a successful entrepreneur, I have the knowledge and skills to help you tackle life’s most daunting tasks and set you up for a successful and fulfilling life. I also offer a handful of behavioral tools to help you change your dysfunctional patterns and utilize your strengths to achieve your dreams. For additional motivation, follow me on instagram @alyceetherapy for useful tips and tools on living a fulfilling life. Looking for more information on Life Coaching? Please continue reading below. This is a common question that I hear from clients. 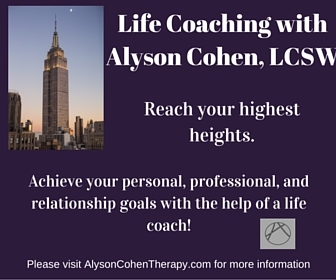 In Life Coaching, you and I will focus on your current stressors, issues, and challenges that you are facing. We will outline and prioritize each challenge and come up with strategies of practical and concrete tools that will help you overcome your barriers. In Individual Therapy, the therapist helps the client to understand what life experiences and difficulty in emotional management has brought about these challenges you are now facing. Life Coaching does not spend much time discovering the root of why the issues have occurred, but more so focuses on solutions and how to overcome the barriers with clear and concrete methods. If you are facing challenges in your life and you feel that you are ready to work on these challenges, then I will be here to help you determine which method of treatment is most appropriate for you. As a Licensed Therapist, I am qualified to help you assess what form of treatment would best meet your needs at this time. It is also possible that while working together during Life Coaching, I may recommend Individual Therapy as a more helpful resource for dealing with your challenges. At which time, you and I can make the decision together about how you would like to move forward. Absolutely! Quarter-life crises are real. Many young adults find themselves suddenly lost in the world upon graduating college and/or graduate school. Your life that has for so many years, been completely scheduled and planned is now open, flexible, and endless-seeming. This can be a major source of stress and anxiety for young adults. Many people experience significant changes at this age and would be benefitted by the aid of a Life Coach. Working with me as your Life Coach, you and I will develop a clear plan of how to identify and achieve your goals. Navigating life after school can be hard, but it can be easier to digest with the help of a Life Coach.